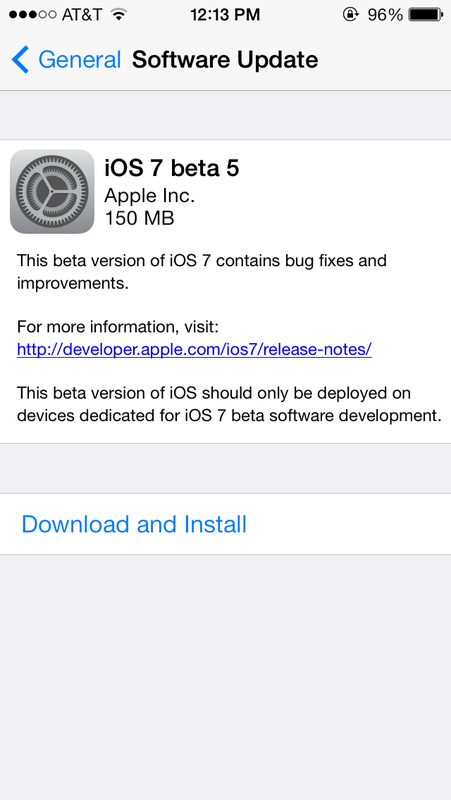 Apple has just released iOS 7 beta 5 to its developers. This updates is available Over-The-Air (OTA) for supporting iPhones, iPods and iPads. Recently, Apple took down its developer portal to completely reconstruct it, and not long after releasing beta 4, Apple just released beta 5. This for sure tells us that the company is hard at work to meet all of its deadlines it has set. Before releasing the Gold Mater version of the software, Apple wants to get as many bugs and fixes out of the way as possible so they can meet their deadline. At this time, no changelog is included in our post, but we will update it as soon as it is available. Stay tuned. The App Store should support the ability to ﬁnd an app capable of opening a received document based on the document’s Uniform Type Identiﬁer (UTI). Currently, just a blank screen is displayed. In Seed 4 and later, the Exchange DeviceIdentiﬁer has been changed back to the behavior of iOS 6 where it uses the serial number. An NSMetadataQuery with ubiquitous scope can now use kMDItemContentTypeTree in predicates. If you use iCloud Keychain with recovery, you may see a dialog indicating recovery has been disabled due to a server change. This is intentional. To reenable functionality, follow the instructions in the notiﬁcation. If you see multiple alerts or observe issues with reenabling recovery, please ﬁle a bug report. After updating to iOS 7 Seed 3 or later, go to Settings > iCloud > Keychain and reenable iCloudKeychain on your devices. Turn of Activation Lock in Settings > iCloud > Find My iPhone. Password ﬁelds are not displayed in alert views for apps in landscape (for example, Game Center authentication or In-App purchase). Text entry still works, though you can’t see what you are typing. If the calls to renderInContext on the layer backing an MKMapView are made of the main thread, they should be eliminated or moved to the main thread. Failure to do so can cause an app crash. Instead of using renderInContext, use the new MKMapSnapshotter APIs. Note: The app is responsible for moving the ﬁle to a permanent location within its sandbox. Background Fetch, Background Transfers, and Remote Notiﬁcation events. as -[UIDevice identifierForVendor]. This change afects all apps running on iOS 7.
example, if the container is retained). alongside proximityUUID (required) in each dictionary in the beacons array. completely. The validation rules have not changed, but validation is now including back ﬁelds. Please check the console log for additional logs. camera access is requested and denied by the user, the video capture session is a black screen. representation of the vendor identiﬁer (-[UIDevice identifierForVendor]). should not dismiss the view controller. nil if the player was created on another thread. a view that has never been committed logs a message and now returns nil. UIViewControllerBasedStatusBarAppearance key to your Info.plist. content hugging priority to minimum, the button will have ambiguous layout. should include this gesture (e.g., Safari). buttons all look the same. authentication or In-App Purchase). Text entry still works, though you can’t see what you are typing. Previously, when the viewport parameters were modiﬁed, the old parameters were never discarded. This caused the viewport parameters to be additive. ended up with a computed viewport of width=device-width, initial-scale=1.0.In iOS 7, this has been addressed. Now you end up with with a computed viewport of initialscale=1.0. scale could be incorrect after rotation. current scale is now correctly restricted within the min-scale, max-scale bounds. behavior is available only for apps linked to an SDK prior to iOS 7.0 when running on iOS 7 or later. Web apps and web clips created prior to Seed 4 will not stay in folders across reboot. MultiPeerConnectivity APIs—will not work properly with older seeds.